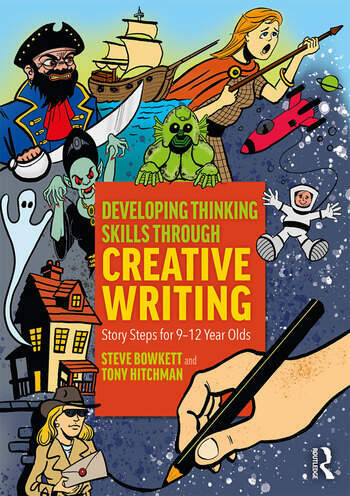 Developing Thinking Skills Through Creative Writing: Story Steps for 9-12 Year Olds is a practical and easy-to-use teacher resource helping children across a wide age and ability range to develop the skills necessary to write more effectively. Step by Step instructions encourage children to tackle tasks of increasing difficulty while broadening their knowledge and experiences of fictional genres. Adaptable to different teaching situations, this book offers the opportunity for teachers to work through the book genre by genre or take a 'skills route' with different activities from different chapters to create their own programme of study. Fully illustrated and supporting the requirements of the National Curriculum, Developing Thinking Skills Through Creative Writing is a valuable aid for all Key Stage 2 teachers. Steve Bowkett is a former teacher and author of numerous books for teachers. He visits schools to run creative writing workshops for children and works as an educational consultant specialising in the areas of thinking skills and problem solving, creativity and literacy.